One of my favorite pet sitting stories comes from my friend Mike. He was once hired to look after 2 small dogs which involved several visits a day. Mike showed up at the new clients house to meet the dogs and go over their routine. During the tour, Mike noticed a cage with 2 guinea pigs. The family never mentioned the guinea pigs and so Mike never asked. He assumed they would be self sufficient or perhaps someone else would be caring for them. (Rule #1 never assume anything in this business) So, for whatever reason, no one mentioned the guinea pigs. Well, on the first visit, Mike was greeted with a note that just casually mentioned that the guinea pig would need to be cared for after all. To Mike's horror, he discovered that "Jimmy" was a little constipated and usually needed help pooping. The instructions and picture left for him are priceless. My favorite part is when they say "There is no need to empty him completely". Oh, what a relief! That note's hilarious. And strangely informative. Except on the topic of how to spell 'guinea pig'. 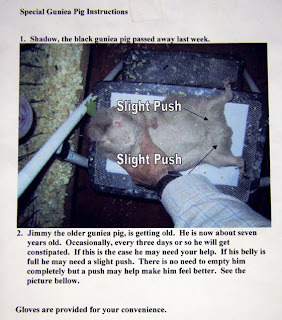 I used to have pet rats and I had a rat named Petunia who had a tumor pressing on her bladder. In order to pee, I had to squeeze on Petunia several times a day. Good times, I tell ya.